Television is on its way out. Streaming devices like Roku, Apple TV and even some TVs themselves bring the internet's best offerings in an on-demand format to living rooms across the world, broadcast time be damned. Some shows aren't even broadcast at all, like the Emmy-winning House of Cards, which was released only on Netflix. And for those looking to get the real scoop on technology news, it's a sure bet that CNN doesn't delve deep enough. For that, viewers and listeners can tune in the TWiT Netcast Group online or on the radio. 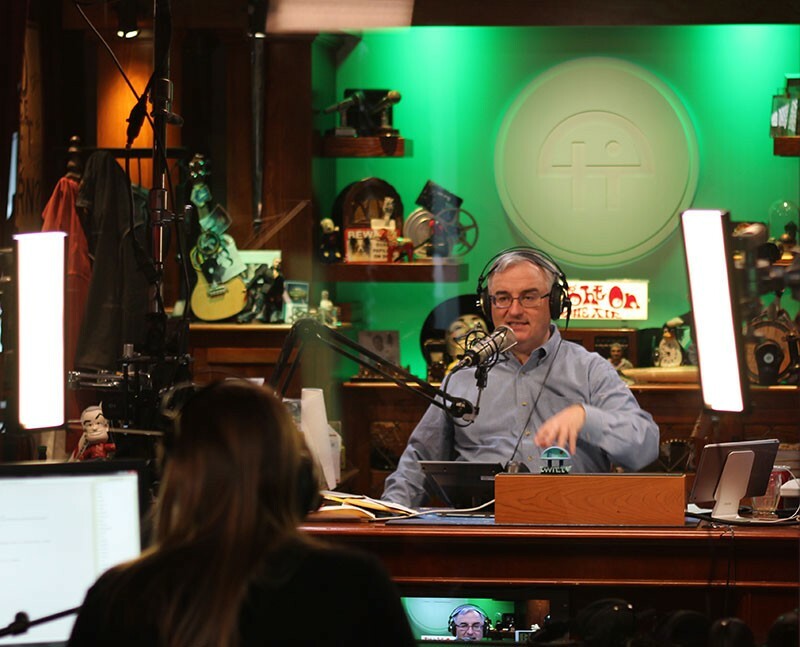 Formerly a local talk radio and television personality, Leo Laporte felt there was a better way to connect with his audience. So in 2004, he founded This Week in Tech, a program that has since blossomed into 26 video and audio shows broadcast to an audience of 6 million through the internet and to over 170 cities on radio every Saturday through Premiere Radio Networks (locally, it's broadcast on 910-AM). "We're able, from the middle of Petaluma, to do an international television and radio show," Laporte says after hosting his radio program, The Tech Guy with Leo Laporte, on a recent Saturday afternoon. He hosts nine shows each week, but the Tech Guy is the only one on broadcast radio. The vibe of the internet media station, which has 25 employees, is that of a small radio or TV station—stuffy corporate jargon and FCC regulations don't stifle the creativity in the building. There's a whole wall of silly hats, and a shelf of obsolete technology serves as a reminder of how far computers have come since the early days of transistor radios and the Apple IIG. Broadcast quality of online programs has come a long way, too. Several HD cameras record the live broadcast, and guests can be brought in via Skype for audience interaction. Since online traffic can be tracked, Laporte knows that about one-third of his audience is not from the United States. They tune in to the show, broadcast from "the northernmost tip of Silicon Valley," as Laporte says, to keep on the cutting edge of technology. "The stuff we do isn't really well covered in television and radio," says Laporte. "Technology coverage in mainstream media is weak. They don't know what they're talking about a lot of the time." The information is often dumbed down, and TWiT's audience wants the gritty details that might turn off the casual listener or viewer, says Laporte. From the name alone, the Paradyne Projection System sounds like it could be something in Disney World's Futureland. But the Paradyne System was actually created in Rohnert Park for the Spreckels Performing Arts Center. Initially introduced for a production of Jekyll & Hyde: The Musical, the idea was to use vivid projections (of streets, the evening sky, various Victorian interiors) instead of actually building sets. Instead of forcing the audience to cool their heels while stagehands wheel off one set and race another into place, a simple click of a mouse can change the setting from the laboratory of Dr. Jekyll into a foggy London back alley. Today, the Paradyne's multiple projectors have become the proudly touted star of the company, used to project more than just static background slides. It can record and project actual moving shots, animations, special effects, subtitles—pretty much anything artistic director Gene Abravaya can dream up. 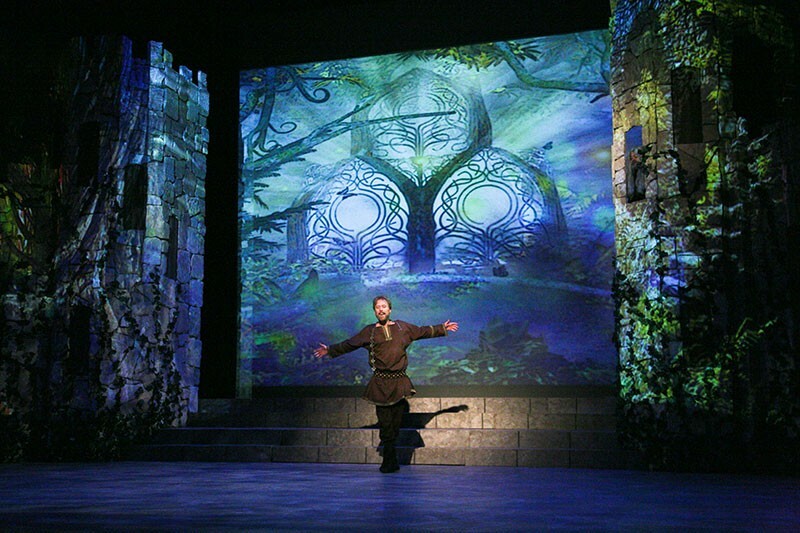 In Camelot, it transformed Paul Gilger's towering castle set into a leafy, magical forest. In Young Frankenstein, it turned a roll in the hay (in a horse-drawn cart) into a thrill ride. In Brigadoon, it expanded the size of the cast, adding moving, waving people for crowd scenes. In Scrooge: The Musical, it gave audiences a talking Marley doorknocker, floating specters, enormous animated coins stacking up in Scrooge's counting house and even the flickering flames of hell. Will the Paradyne Projection System eventually be adopted by other theater companies? Well, that possibility is not difficult to picture. 5409 Snyder Lane, Rohnert Park. 707.588.3434. www.spreckelsonline.com.—D.T. He looks like he might be a derelict and sounds like he sips whiskey at a dive all night long. Tom Waits is perhaps the North Bay's most famous nighthawk, though he goes largely unrecognized in Sonoma County, where he's lived for years. Nobody wears the cloak of anonymity with more panache. While Waits trades on his image as consummate bad boy—Bad As Me is the title of his most recent CD—no celeb does more good for his fellow citizen. Not long ago, he helped out with a benefit for the Redwood Empire Food Bank. Last fall, he raised money for the Bridge School, the nonprofit that provides education for students with impediments. Waits isn't trying to prove anything, except perhaps that he does it his way and makes it look easy. He'll celebrate his 65th birthday this year, but he's never outgrown his youthful persona as the crown prince of cultural nonconformity.—J.R. Penngrove's legendary Twin Oaks Tavern has been serving serious drinks and toe-tapping tunes since the 1920s, when the roadside honky-tonk was a major stopping spot alongside the pre–101 Old Redwood Highway. Over the years, it's become a haven for local ranchers, cowboys, bikers and businessmen. Now under the management of new owner Sheila Groves-Tracey, longtime music booker at the Mystic Theatre in Petaluma and the Uptown in Napa, the historic Twin Oaks is enjoying a bit of resurgence. Retaining the funky Steinbeckian décor it's had for years, the place is seeing a return to its reputation as the place to go for hot local music. It's not unusual to see young couples at the bar sipping boutique wines side-by-side with old-timer cowboys tossing back a bourbon or a cold Budweiser. The Twin Oaks Tavern is edging into the future, while still staying firmly ensconced in the glow of its glorious past. 5745 Old Redwood Hwy., Penngrove. 707.795.5118.—D.T. "I would rather be ashes than dust," Darius Anderson says, quoting Jack London. He means it, too—no one knows London from the inside out better than Anderson, and no private individual has a more impressive collection of London's books and letters. Similar to the Call of the Wild author, Anderson, a major lobbyist and principal owner of Sonoma Media Investments (Press Democrat, Sonoma Index-Tribune), knows what it's like to be wild. And like London, he doesn't understand average and normal. Born and raised in Novato, the Santa Rosa Junior College graduate has raked in more money for more California Democrats than any other fundraiser in the Golden State. Name one, and Anderson's sure to know have a connection, from Sens. Feinstein and Boxer to Gov. Jerry Brown. Thanks to Anderson and his friends at Station Casinos, the new Graton Casino outside of Rohnert Park found a home in Sonoma County rather than in Lake County. When he's not wheeling and dealing in Sacramento, or at home with his wife in Kenwood, he's in Cuba buying up some of the island's best art, smoking its best cigars and carousing with the young and the restless. Like London, Anderson embraces success, and both share an affinity for the underdog.—J.R. Back in 1978, director George Lucas bought a parcel of land in the hills of Marin. The director was fresh off a little sci-fi opera called Star Wars and was looking for a haven to continue his innovations. Named after the hero of his story, Skywalker Ranch eventually expanded to a 2,000-acre compound that's a world unto itself. After the advent of THX sound technology, Skywalker Sound was established on the ranch in 1987 to provide post-production audio services for film, television, video games and more. Now one of the largest such facilities in the world, Skywalker Sound is where the T. rex from Jurassic Park got his roar, where the robotic friends of Wall-E acquired their blips and beeps and where explosions in The Avengers got their earth-shaking rumble. One of three major campuses under the Lucasfilm umbrella, Skywalker Sound is housed in the ivy-covered Technical Building and boasts six mixing studios, several editing rooms and a world-class scoring stage, capable of housing a 130-piece orchestra. The Marin County institution, which employs around 100 staffers and works on over 20 films every year, is one of the most sought-after production houses in the world. Yet even after 25 years, Lucas is still struggling to see his full vision become a reality. Earlier this year, proposed construction of the Lucas Cultural Arts Museum in San Francisco fell through when the Presidio Trust rejected the plan to build it at Crissy Field. But not all is lost for the educational center, as Oakland councilwoman Rebecca Kaplan recently wrote to Lucas offering her city as the new site. As the road to the Cultural Museum stretches out, the talented innovators of Skywalker Sound and Lucasfilm continue to advance the movie-going experience, telling stories with pioneering technology.—C.S. I call him Harold—the wire man hanging from the top of a three-story building in downtown Santa Rosa, at Mendocino and Seventh. But, really, Harold is more than one man; he's two—a virtual clone always stands beside him. The snazzily dressed duo oversee the hustle and bustle of city life, and probably have more than one story to tell about late-night debauchery. 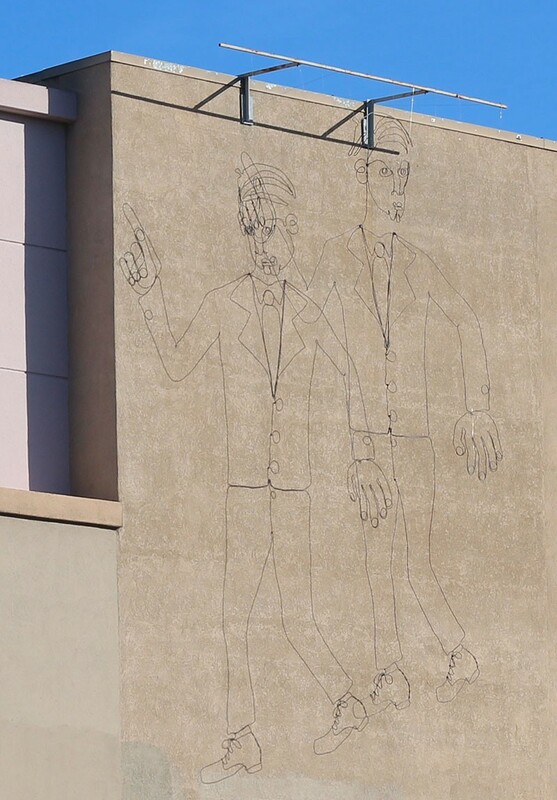 In reality, it's a shadow that appears because of the sculpture's proximity to the building, but the way it's cast makes it appear just slightly different from the original, with one looking right and one looking left. Harold (as well as his shadow-clone) was born in 2009 as part of Santa Rosa's public art program, says coordinator Tara Matheny-Schuster. Created by Seth Minor after he won an Emerging Artist Award from the city, Wire Guy is made from one continuous piece of wire. It's now part of the city's Artwalk program, on loan through the end of this year. No word yet on a possible extension, but since it's already installed, it certainly would be a shame to have to remove it—especially considering it would be like removing two pieces of public art instead of one.—N.G.